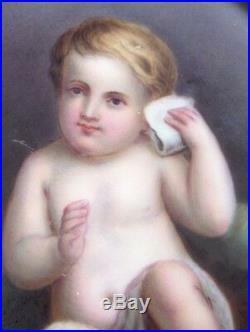 A nice porcelain plaque made in Germany or possibly in France in the mid to late 19th century. 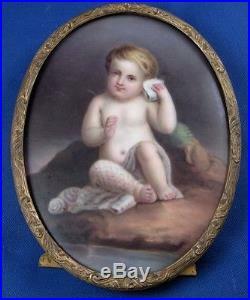 It is hand painted with a scene of a child sitting on the beach listening to a sea shell with a net over his legs and some seashells by his feet. The quality of the plaque is quite nice with a great theme. It comes in a metal frame that works OK with it I thin but I do not think it is original to the piece though it fits in well. The plaque is in great condition with some minor wear to it. It is marked on the back with the letter K over the numbers 12 impressed. The plaque is of a nice size being about 5 inches tall and 3.875 inches wide. The frame is in good condition with some oxidation to it. It is marked on the back with laurel leaves and some writing I cannot make out. It has a stand to be able to stand it on a table or some wire to hang it on the wall. Not sure why I didn't take a pic of the back of the plaque - must be getting old : If you need one just ask! If you like my goodies have a look at my other auctions for a lot more top maker pieces like KPM , Paris and so on. Photos are part of the description - if you need others just let me know exactly what you are looking for and I'll take care of it speedily! Please do not send me questions on items other than my own! The item "Antique German Porcelain Child Beach Scenic Plaque Porzellan Bild Scene French" is in sale since Sunday, March 3, 2019. This item is in the category "Pottery & Glass\Pottery & China\China & Dinnerware\KPM". The seller is "kpmisbetter" and is located in Sparta, New Jersey. This item can be shipped worldwide.